Brain oscillatory activities are stochastic and non-linearly dynamic, due to their non-phase-locked nature and inter-trial variability. Non-phase-locked rhythmic signals can vary from trial-to-trial dependent upon variations in a subject's performance and state, which may be linked to fluctuations in expectation, attention, arousal, and task strategy. Therefore, a method that permits the extraction of the oscillatory signal on a single-trial basis is important for the study of subtle brain dynamics, which can be used as probes to study neurophysiology in normal brain and pathophysiology in the diseased. 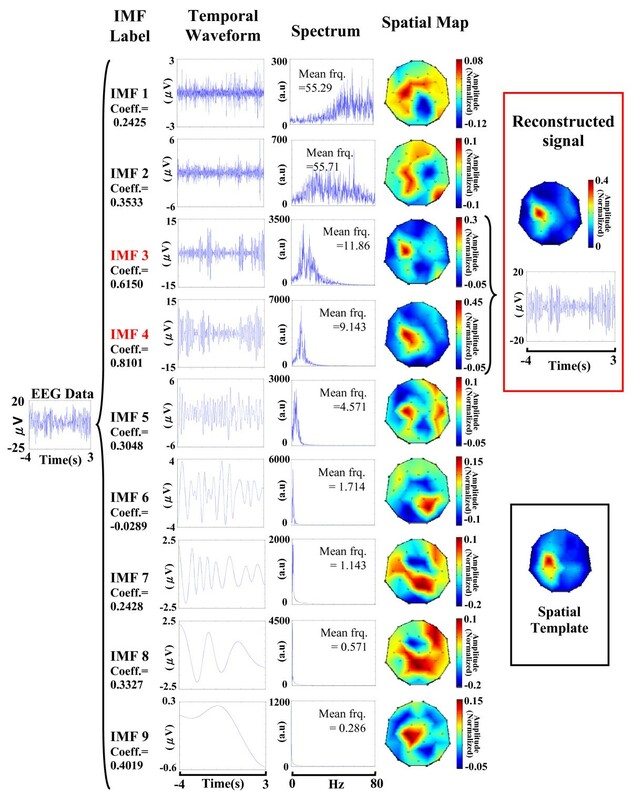 This paper presents an empirical mode decomposition (EMD)-based spatiotemporal approach to extract neural oscillatory activities from multi-channel electroencephalograph (EEG) data. The efficacy of this approach manifests in extracting single-trial post-movement beta activities when performing a right index-finger lifting task. In each single trial, an EEG epoch recorded at the channel of interest (CI) was first separated into a number of intrinsic mode functions (IMFs). Sensorimotor-related oscillatory activities were reconstructed from sensorimotor-related IMFs chosen by a spatial map matching process. Post-movement beta activities were acquired by band-pass filtering the sensorimotor-related oscillatory activities within a trial-specific beta band. Signal envelopes of post-movement beta activities were detected using amplitude modulation (AM) method to obtain post-movement beta event-related synchronization (PM-bERS). The maximum amplitude in the PM-bERS within the post-movement period was subtracted by the mean amplitude of the reference period to find the single-trial beta rebound (BR). The results showed single-trial BRs computed by the current method were significantly higher than those obtained from conventional average method (P < 0.01; matched-pair Wilcoxon test). The proposed method provides high signal-to-noise ratio (SNR) through an EMD-based decomposition and reconstruction process, which enables event-related oscillatory activities to be examined on a single-trial basis. The EMD-based method is effective for artefact removal and extracting reliable neural features of non-phase-locked oscillatory activities in multi-channel EEG data. The high extraction rate of the proposed method enables the trial-by-trial variability of oscillatory activities can be examined, which provide a possibility for future profound study of subtle brain dynamics. Neural network in the human brain is a dynamic system, responding to external or internal trigger events in a fraction of a second. The event-related changes in neural oscillatory activities usually contain significant physiological information, which can be either phase-locked or non-phase-locked reactive to the trigger stimuli. These oscillatory activities usually exist in specific spatial locations and in particular frequency bands . Event-related power changes in oscillatory activities occur in specific frequency bands which may reflect the synchrony of certain activated neurons in the underlying neuronal population. Many clinical diagnoses report the human cortical sensorimotor rhythms, observed over the sensorimotor area and characterized by dominant frequencies in ~10 and ~20 Hz bands, as an efficacious index [2–13]. The power changes in ~20 Hz range mainly originate in the anterior bank of the central sulcus, and the ~10 Hz component is concentrated dominantly in the cortex posterior to the central sulcus. In normal subjects, voluntary movements result in a power decrease approximately 2 sec preceding movement-onsets and followed by a fast post-movement beta rebound in ~20 Hz (beta band). Previous researches have suggested that the power decrease, owes to the decrease of synchrony in the underlying neural substrate, serving as physiological meaning of motor planning and movement preparation, while the increase of power in the post-movement beta band may reflect deactivation/inhibition during the recovery phase in the movement process. Due to fast temporal changes in brain oscillatory activities, EEG (Electroencephalogrpahy) and MEG (Magnetoencephalography), with temporal resolution of a millisecond, are often chosen as powerful tools to study these oscillatory activities. To quantify the event-induced oscillatory changes, several efficient measures have been developed for analyzing event-related oscillatory activities. Pfurtscheller et al. [6, 14–16] developed an event-related desynchronization/synchronization (ERD/ERS) technique to analyze event-induced oscillatory activities of sensorimotor rhythms generated in the primary sensorimotor cortex. Clochon et al. utilized amplitude modulation (AM) method to delineate the signal envelopes of oscillatory activities . Klimesch et al. further removed the rectified phase-locked components from ERD/ERS by calculating the inter-trial variance . Florian and Pfurtscheller modeled the significant frequency components in oscillatory signals by means of the autoregressive (AR)-based method . Salmelin et al. proposed the temporal-spectral evolution method (TSE) to filter oscillatory signals in pre-defined equi-bandwidth frequency bands followed by a rectifying and averaging process . These aforementioned approaches presume a stereotypical frequency band and temporal characteristics across trials and require an average of dozens of trials for ERD/ERS calculations  which are unable to account for subtle trial-by-trial dynamics. At least three techniques have been developed to extract single-trial event-related oscillatory activities. Pfurtscheller et al. utilized adaptive autoregression (AAR) and minimum Mahalanobis distance (MDA) to discriminate EEG oscillatory activities induced from four different limb movements [22, 23]. Lee et al. proposed an independent component analysis (ICA)-based approach to extract post-movement beta oscillatory activities  and has been utilized to diagnose Parkinson's Patients . Qin and He applied the Morlet wavelet to extract temporal-frequency features of movement-induced ERD/ERS while subjects performed motor imagery tasks . Nevertheless, these methods extract oscillatory activities with presumed basis functions or pre-specified statistical models for signal extraction, which might be too stringent to represent single-trial information. 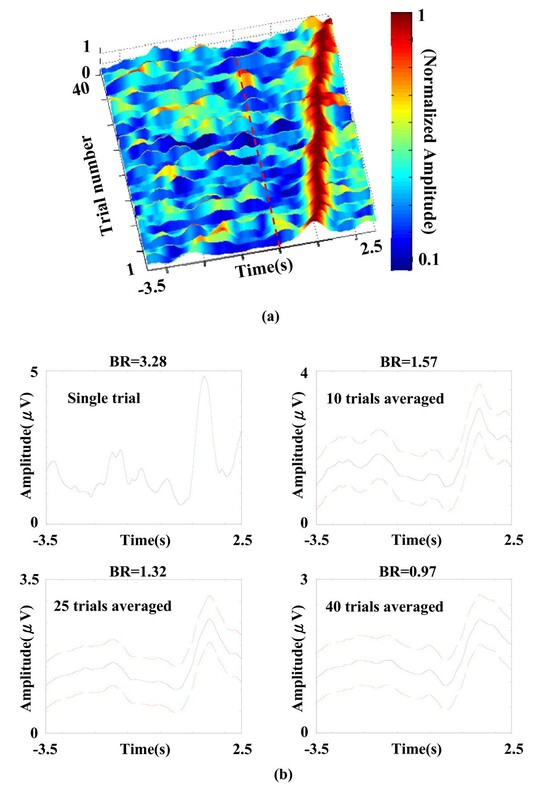 This paper presents an empirical mode decomposition (EMD)-based method to extract single-trial event-related oscillatory activities from EEG data. The efficacy of the proposed method has been manifested by single-trial extraction of post-movement beta ERS (PM-bERS) during self-paced right index-finger lifting task in this study. Since studies have suggested that brain oscillatory activities be stochastic and non-linearly dynamic, EMD, a powerful tool for analyzing nonlinear and nonstationary time series, might be helpful for extracting event-related oscillatory activities [19, 26, 27]. First, this work decomposed each EEG epoch recorded at the channel of interest (CI) into a finite number of intrinsic mode functions (IMFs) using EMD based on a sifting process . Second, the spatial map of each IMF was created using the spatial weight distribution of each IMF on different EEG channels. Third, the IMFs, which retain high correlation values between their spatial maps and a pre-set spatial template, were chosen as sensorimotor-related IMFs for reconstructing noise-suppressed sensorimotor-related oscillatory activities. Finally, the reconstructed oscillatory activities were band-pass filtered within a trial-specific beta band and then rectified to detect single-trial beta rebound (BR). This study presents an EMD-based method for extracting oscillatory activities in single-trial multi-channel EEG data. The salient feature of the proposed method is the use of a spatial map creation process to represent the spatial weights of IMFs on different EEG sensor sites, so that sensorimotor-related IMFs can be chosen by means of a spatial map matching process. The present approach requires no pre-defined statistical model or basis, which may provide a window to study intricate brain dynamics on a trial-by-trial base. Five healthy right-handed subjects (20-30 years old) participated in this study. The research was carried out in compliance with Helsinki declaration. All subjects gave informed consent, and the study was approved by the Ethics Committee of Institutional Review Board (IRB), Taipei Veterans General Hospital, Taiwan. All measurements were noninvasive and the subjects were free to withdraw at any time without any penalty. Subjects were asked to perform self-paced right index finger lifting approximately once every 8 seconds. Each movement was requested to be performed briskly for a duration of 200 to 300 ms, monitored by surface electromyogram (EMG) on extensor digitorum communis, with a range of finger movement around 35° ~ 40°. To prevent subjects from falling fatigue, a 5-minute break was given every 30 trials and 150 trials were acquired in each subject. EEG data were acquired by a 32-channel whole-head EEG system (band-pass, 0.05-100 Hz; sampling rate, 1000 Hz; Quick Amp., Brain Products, Co., Munich, Germany). Bipolar vertical and horizontal electrooculograms (VEOG and HEOG) were placed below and above the left eye and at the bilateral outer canthi to monitor eye movements and blinks. Epochs were segmented from EEG recordings from -4 s to 3 s anchored to movement onsets [2, 20] and only those artifact-free epochs (EOG < 100 μV) were subjected to EMD decomposition. Empirical mode decomposition (EMD) attempts to sequentially decompose a signal into the sum of a finite number of intrinsic mode functions (IMFs) [28–30]. Each IMF is decomposed with the following definitions: (1) the number of local extrema (including local maxima and local minima) and the number of zero-crossings must be either equal or differ at most by one, and (2) the mean value of the envelope defined by the local maxima and the envelope defined by the local minima is zero. This study manifests feasibility of the present method in extracting oscillatory activities during the right index-finger lifting task. EEG signal acquired at C3 channel (see Figure 1(a)), overlying the primary sensorimotor area (SMI) in the left hemisphere, was chosen as the channel of interest (CI) for the EMD process [14, 15]. The creation of spatial templates. (a) The EEG montage used in this paper where C3 is marked by a red circle. (b) Conventional ERSs obtained from four subjects (template generation group) using AM method. (c) The common spatial template is created by averaging the post-movement BRs across subjects (400 trials, 100 trials for each subject, 4 subjects pooled). stopping the sifting process until the residue function becomes a monotonic function where no more IMFs can be extracted. Flow-chart of the EMD-based spatiotemporal approach. where and are the mean values of and , respectively. The correlation coefficients between all EEG channels and the j th IMF are arranged into a vector , in which ,and is designated as the spatial map for the j th IMF. where s 1 is a group containing the index number of IMFs belonging to the highly-correlated group (see Figure 3). Examples of IMF selection and signal reconstruction procedure. 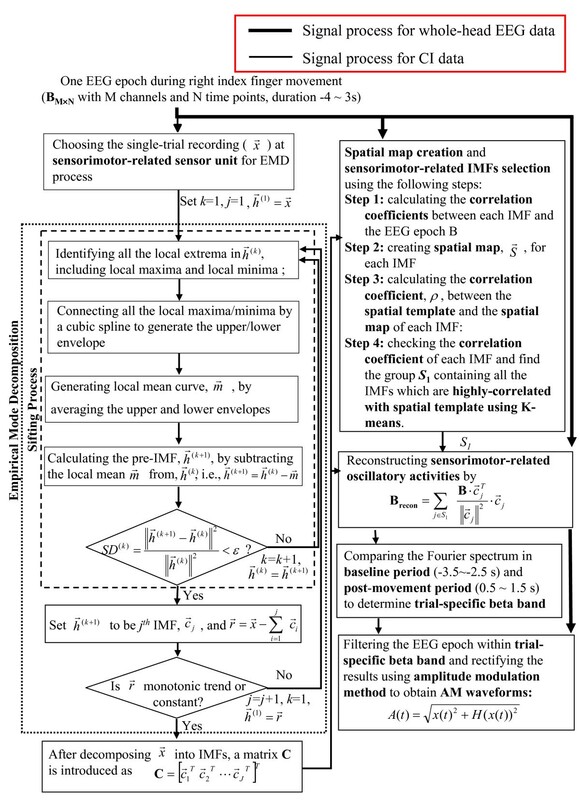 IMF waveforms, Fourier spectra and spatial maps of IMF waveforms obtained from one single-trial epoch using EMD. Only IMF 3 and IMF 4, having high correlation with the spatial template, are selected for signal reconstruction. Detecting trial-specific beta band for extracting sensorimotor-related oscillatory activities. a) The reconstructed sensorimotor-related oscillatory activities in figure 3. (b) The trial-specific beta band was determined by comparing the post-movement Fourier spectrum (solid line) with the one estimated from baseline period (dashed line). (c) The subtracted spectrum and the trial-specific beta band (15~20 Hz). where M BP (t) is the band-pass filtered EEG signal, H(M BP (t)) is its Hilbert transform and m(t) is the calculated AM waveform. The beta rebound (in C3 channel) is detected to evaluate the performance of the extracted post-movement beta ERS (PM-bERS). The maximum amplitude within the post-movement period (0.5 s ~ 1.5 s) in the AM waveform is then subtracted by the mean amplitude of reference period (-3.5 s ~ -2.5 s) to find the reactive activity in beta band, and only the value in the channel with maximum beta-band reactive activity is defined as beta rebound (BR) for subsequent statistics of inter-individual comparisons (see Figure 5). Example of the time course of one single-trial PM-bERS in C3 channel (after filtering within 15~20 Hz) during the right index-finger lifting task. This study utilizes an electrode montage analogous to the EEG international 10¬20 system . Since the EEG international 10-20 system was developed to ensure the reproducibility of EEG experiments by standardizing each EEG channel to a specified brain region, neural activities generated from a particular brain region might be able to be recognized from its spatial weight distribution over different EEG channels. This study focuses on studying the single-trial BR in the contralateral sensorimotor area. Accordingly, a spatial template, created by computing post-movement beta rebounds (post-movement BRs) in conventional event-related synchronization (ERS) over all EEG channels, was utilized to facilitate the selection of sensorimotor-related IMFs. To demonstrate the feasibility of this standardized spatial template, four out of the five recruited participants in this study are used for generating a spatial template (template generation group), while the last participant (subject V) is used for validation (validation group). The conventional ERS technique [6, 34] filters EEG data within the task-specific beta bands [6, 21] and rectifies (see Figure 1(b)) the filtered signals using AM method  to obtain signal envelopes (see Eq. 7). The task-specific beta band is determined by the contrast between two 1-s amplitude spectra calculated over about 100 event-related EEG trials at the CI channel , one (serving as rest reference) is computed over the duration from -3.5 to -2.5 s preceding the onset of movement, and the other (serving as reactive target) from 0.5 to 1.5 s after the onset of movement (see Figure 4). Post-movement BR is then computed as the difference in amplitude between the maximum amplitude of ERS for each sensor site in the post-movement (0.5 to 1.5 s) interval and the mean activity between -3.5 and -2.5 s . The BRs are averaged across the subjects (400 trials, 100 trials for each subject, 4 subjects pooled) to create a common spatial template (see Figure 1(c)). Figure 3 shows an example of the EMD process in subject V. One EEG epoch (-4 s ~ 3 s) recorded at C3 position was decomposed into nine IMFs. The temporal waveforms, Fourier spectra and spatial maps of IMFs are shown in the second, third, and fourth columns, respectively. The correlation coefficients between the spatial maps of IMFs and the spatial template are 0.24, 0.35, 0.62, 0.81, 0.30, -0.03, 0.24, 0.33 and 0.40 for IMF1 to IMF9, respectively. The IMF3 and IMF4 (marked in red), with correlation coefficients categorized as the highly-correlated group (correlation coefficients are 0.62 and 0.81, respectively), were designated as sensorimotor-related IMFs for further processing. Other IMFs, which are middlely- or lowly-correlated with the spatial template, were considered as sensorimotor-unrelated IMFs and should be excluded in the following data reconstruction process to avoid deteriorating the signal-to-noise ratio. The proposed spatial map matching process provides an effective way for identifying sensorimotor-related IMFs. For example, the IMF1 and IMF2, having widely-spread spatial maps with frequencies close to 60 Hz, can be inferred as environmental electricity noise. Other IMFs (IMF5 to IMF9), whose oscillatory frequencies are low and beyond the frequency range of sensorimotor rhythms (10 Hz ~ 26 Hz ), might be belonged to low-frequency disturbance drifts and should be removed. Accordingly, the sensorimotor-related IMFs (IMF3 and IMF4) can be recognized by checking their spatio-temporal characteristics to reconstruct noise-suppressed sensorimotor-related oscillatory activities. Using the aforementioned IMF selection process, sensorimotor-unrelated IMFs can be removed. The retention of high SNR in the reconstructed signals allows the detection of beta rebound (BR) could be achieved by the determination of reactive frequency band in each single trial. Figure 4(a) shows a reconstructed noise-suppressed sensorimotor-related oscillatory activity with two defined time intervals, the baseline (-3.5 s ~ -2.5 s) and post-movement (0.5 s ~ 1.5 s) periods. In Figure 4(b), the post-movement Fourier spectrum (solid line) was subtracted by the one estimated from the baseline period (dashed line) to determine the trial-specific beta band. The subtracted spectrum is shown in Figure 4(c), where the threshold indicated by the dashed lines was obtained by two times the standard deviation of the subtracted spectrum, and only those frequencies in the beta band emerging from the threshold were designated as the trial-specific beta band. By filtering the sensorimotor-related oscillatory activities within the trial-specific beta band (see Figure 4(c)) and rectifying them using AM method, rectified post-movement beta ERS (PM-bERS) were obtained (see Figure 5). The peak with maximum amplitude within the post-movement period (0.5 s ~ 1.5 s) was detected and subtracted by the mean amplitude of the baseline period (-3.5 s ~ -2.5 s) to calculate the beta rebound (BR) (3.28 μv in Figure 5). Since the PM-bERS can be single-trial extracted with the help of the aforementioned IMF decomposition and data reconstruction process, the inter-trial variation in extracted PM-bERSs can be examined. Figure 6(a) shows the raster plot of PM-bERSs extracted from 40 single trials in subject V, where PM-bERSs were sorted by the latencies of their amplitude peaks, with amplitudes normalized to their peak amplitudes. The dashed line marks the timing of movement onset. Jittering was observed in the latencies of amplitude peaks in PM-bERSs across different trials (mean ± sd. = 1.64 ± 0.46 s). 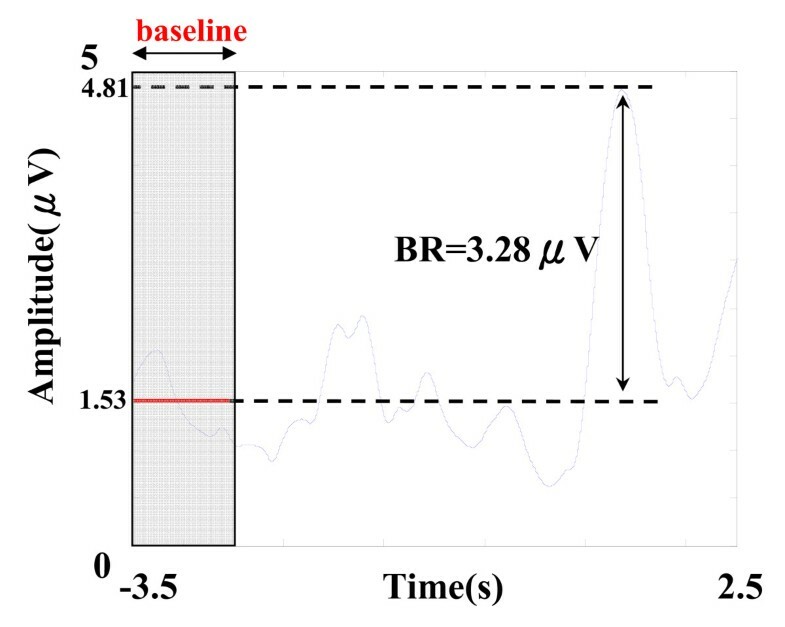 Smearing of EEG profile and decrease of BRs due to latency jittering. (a) The raster plot of PM-bERSs extracted from 40 single trials in subject V, where PM-bERS were sorted by the latencies of their amplitude peaks, with amplitudes normalized to their peak amplitudes. (b) The amplitudes of BRs are 3.28, 1.57, 1.32, and 0.97 μV after averaging PM-bERSs over 1, 10, 25, and 40 trials, respectively. Since the inter-trial latency jittering within the post-movement period varied across trials, simple averaging, such as conventional ERD/ERS methods, might attenuate and smear the resultant BR values. The amplitudes of BRs are 3.28, 1.57, 1.32, and 0.97 μV after averaging PM-bERSs over 1, 10, 25, and 40 trials, respectively (see Figure 6(b)). This demonstrates that latency jittering and inter-trial variability can inevitably lower the estimated value of beta rebound (BR). Using the proposed EMD-based single-trial method, the current work permits BR value to be detected in a single trial which avoids the smear of BR value caused by cross-trial averaging in conventional ERS process [6, 34]. The values of BRs obtained from our EMD-based method were 1.98±0.95, 1.31±0.55, 1.93±0.79, 1.87±0.44, and 1.32±0.56 μV with peak latencies of 1.64±0.46, 1.26±0.32, 1.22±0.19, 1.39 ±0.40, and 1.32 ±0.25 in the five subjects (Table 1), respectively. In contrast with BRs obtained from the conventional method, BRs amplitudes were 0.91, 0.40, 1.48, 0.53, and 0.89 μV, respectively. The single-trial BRs computed by our EMD-based method were significantly higher than the BR obtained from the conventional average method (P < 0.01; matched-pair Wilcoxon test). The statistical results over all the five subjects are listed in Table 1. Human brain rhythms are stochastic whose amplitudes, frequencies and phases can vary from trial to trial. The inter-trial fluctuations are usually contingent on a subject's performance and states, which may be linked to fluctuations in parameters of expectation, attention, arousal, and task strategy [36–41]. Therefore, those methods, such as conventional ERD/ERS techniques, using stereotypical frequency-ranges across trials for extracting neural oscillatory activities in EEG/MEG recordings, may cause single-trial reactive frequency ranges to fall out the fixed filter window [6, 20] and result in misleading conclusions. 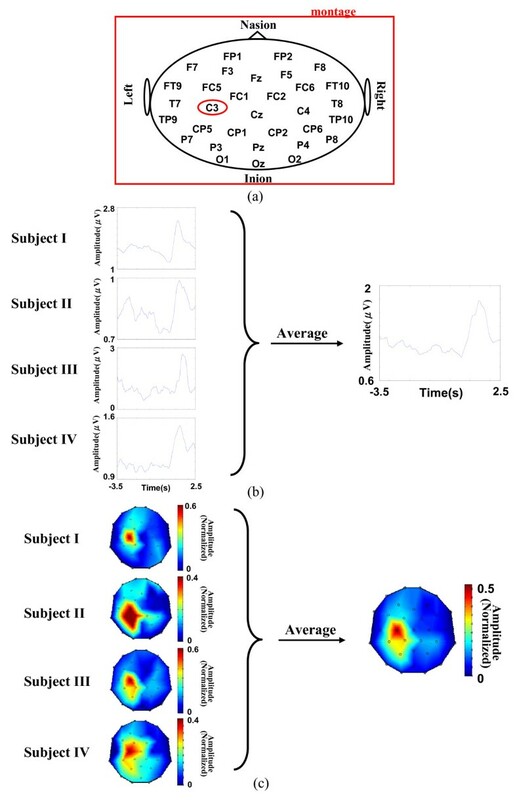 This study develops an EMD-based spatiotemporal approach on EEG data to detect post-movement beta activities in a single trial. EMD is a data-driven analysis method that separates the signal into a number of IMFs without requiring prior knowledge . Each IMF is an analytic and self-constructed function with time-varying frequencies. The IMF presents great flexibility to adapt itself for featuring frequency changes in a local time period [28, 29]. In contrast with other conventional integration transform techniques, such as short-time Fourier transform (STFT) and wavelet-based methods, the temporal-frequency characteristics of a signal are analyzed by setting a pre-defined basis within fixed time windows, which may be too stringent to express the subtle dynamic in brain oscillatory activities. Accordingly, the proposed method may help unveil the subtle dynamics in intricate neural networks. The proposed EMD-based method determines the trial-specific beta band for each single trial which permits extracting sensorimotor-related oscillatory activities in a single trial. Compared to conventional methods which discount subtle inter-trial changes, the task-related frequency band for band-pass filtering is fixed across all trials and the rectified oscillatory activities are averaged over a large number of trials . Figure 6 shows that inter-trial jittering in latencies of amplitude peaks causes resultant BR suppression in the PM-bERS (see Figure 6(b)). Due to inter-trial variation in amplitudes, phases and oscillatory frequencies, using an ensemble average across trials is inadequate to resolve intricate neural dynamics. Table 1 demonstrates the superiority of the single-trial approach over the conventional ensemble average methods [6, 34] by comparing BR values (p < 0.01). The current proposed method is different from other EMD-based approaches [2, 17, 20, 28, 29, 35, 42–45]. One distinct feature is the use of spatial information (spatial map) for selecting sensorimotor-related IMF. The spatial map for each IMF is created based on the premise that any two distinct rhythmic brain signals are usually independent and uncorrelated with each other [46–49]. The distinct feature is different from other single-channel EMD studies which provide only the temporal-frequency information of IMFs. The lack of spatial information might not be comprehensive enough and could result in misleading consequences in selecting sensorimotor-related IMFs. For instance, signals outside the sensorimotor area with frequencies overlapping the beta band might be difficult to discern from temporal-frequency representations only. Owing to the benefit of the EEG international 10-20 system, which standardizes each EEG channel to a specified brain region, researchers can render electric potentials, generated from a specific brain region, recorded by an EEG international 10-20 electrode system into a spatial map with particular spatial weight distribution. Unlike other EMD-based studies which selected sensorimotor-related IMFs by examining signal features on temporal waveforms only, we screened IMFs relevant to a specific brain region by comparing their spatial weight distribution with a customized designed spatial template. This present approach avoids the pitfall that temporal waveforms of EEG activities vary from trial-to-trial contingent upon variations in a subject's performance and state. This paper focuses on studying movement-induced beta EEG oscillatory activities in the right index-finger lifting task, and creates a spatial template with high spatial weights over the left sensorimotor area (EEG C3 channel) to facilitate selecting sensorimotor-related IMFs. Classifiers, such as K-means, artificial neural network (ANN) etc. can then automatically select sensorimotor-related IMFs. Such a combined approach is efficient for removing artifacts and extracting reliable neural features in single-trial multi-channel EEG data (see Figure 3). It is worthy to notice that this template-based IMF screening approach is simple with great flexibility. EEG activities in other brain regions can be extracted by choosing a CI for EMD computation, and designing a spatial template relevant to the interested brain region. For example, sensorimotor rhythmic activities in the right hemisphere can be extracted by designing a spatial template with spatial weight focusing on the right sensorimotor area. This paper presents an EMD-based method to extract single-trial oscillatory activities in multi-channel EEG data. The EMD-based method manifests several advantages in neurophysiological studies and clinical applications. 1) It is effective for artifact removal and extracting reliable neural features in single-trial multi-channel EEG data. 2) The method accounts for subtle trial-by-trial dynamics to preserve inter-trial variability of rhythmic activities and investigates the transitory or intermittent states in brain dynamics. 3) The single-trial approach permits an effective alternative in cases where participants cannot endure lengthy procedures or in clinical settings where patients have attention problems or are incapable of sustaining long experiments. 4) The high extraction rate of oscillatory activities could also be beneficial for brain computer interface (BCI) [6, 15, 50, 51] which requires recognizing brain signals as control signals in few trials. This study was funded by the National Central University, National Science Council (95-2314-B-075-118, 96-2628-E-008-070-MY3 , 96-2221-E-008-122-MY3, 96-2221-E-010-003-MY3, 96-2221-E-008-115-MY3, 96-2752-B-010-008-PAE), and Veterans General Hospital University System of Taiwan Joint Research Program (VGHUST96-P4-15, VGHUST97-P3-11, VGHUST98-P3-09, VGHUST99-P3-13), Taoyuan General Hospital Intramural Project (PTH-9819). CLY carried out the EEG data analysis by EMD and drafted the manuscript. HCC and CHW participated in the design of the study and performed the statistical analysis. PLL supervised the study, helped drafting and revising the manuscript. All authors read and approved the final manuscript.